Heat a tsp of oil in a pan. Add garlic and the white bits of the onion. Stir for a minute or so until lightly browned. Add the green parts of onion and corn, then stir for a few seconds and add the rice. Add roughly 1/4 tsp each of salt and black pepper - or more, or less - it's hard to say when it comes to salt. Mix well, then add 1 1/4 cup water (or as much as your rice package says). Bring to a boil, then cover, reduce the heat to a simmer and cook for 15 minutes. Allow to rest for another 15 minutes (and no, don't peak or the steam will escape). Quick and easy one pot meal. Such a quick, easy and fabulous one pot meal looks yummy! the recipe sounds comforting and a quickie too. :) Thanks for sharing! 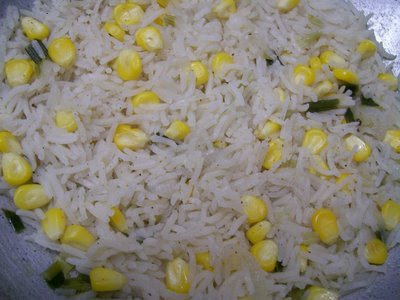 My kids love corn ..never thought of adding it to rice ! Thanks for the post. In making chinese, dont u seperately stirfry the veggies and add later instead of boiling it all together? lazy fried rice..eh? I do this too sometimes. Less oil too. Yummy.